Shop devices on sale with free shipping. Get free devices, devices for only $0.01, and save up to 90% with new contracts. Save up to $40 instantly on refurbished devices from AT&T. Get prepaid phones by AT&T. Great service, great prices, great products – that is AT&T Wireless. If you gotta go wireless (and you do), go with the people who invented telecomm in the first place. Dial up that AT&T wireless coupon code for even more savings and you’ll never look back at your old carrier again. AT&T Wireless has great smartphones, data plans, value, and customer service. AT&T Wireless continue to be a leader of telecomm. 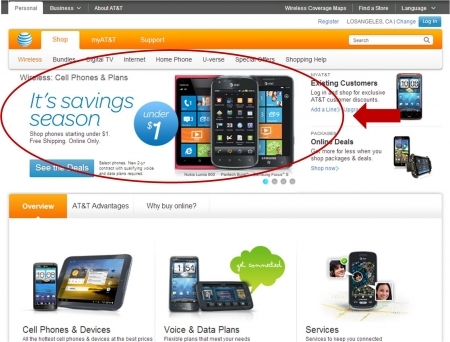 Below are instructions on how to use and apply an AT&T wireless coupon code for huge savings. 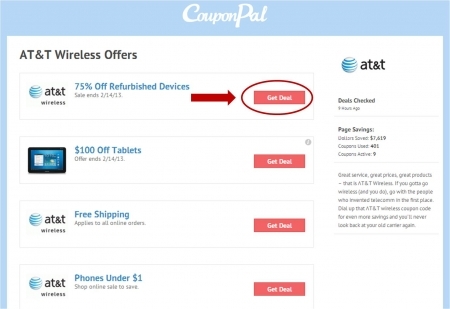 After locating the coupon or deal you want to use to purchase AT&T wireless products and services, click the corresponding "Get Deal" button on the Couponpal Website. A new window will pop open when you click on your button. "Get Deal" is a promotion which means you will not need a code when you finalize your purchase. Clicking "Get Deal" means you will automatically be directed to the promotional page. If there are multiple promotions on the same page, click on the graphic that describes the "Deal" that you are looking for. Sort through the cell phones & mobile devices by using the filters on the left side of the screen. Filter by contract length, pricing, condition, operating system, style, features, manufacturer, and availability. 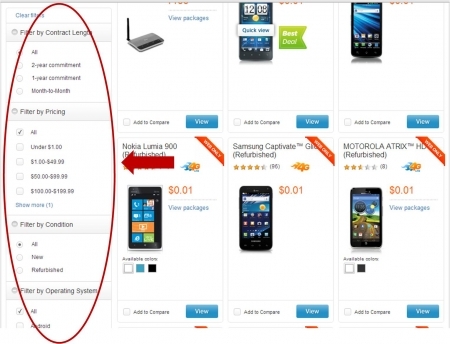 When you find a cell phone or mobile device that you like, click on "View" to be taken to the product page for more details. 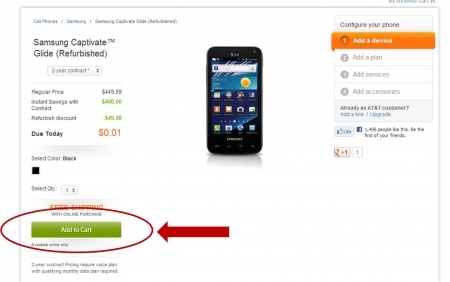 To purchase the cell phone or mobile device, click "Add to Cart." If you are a new AT&T Wireless customer, click "Continue." 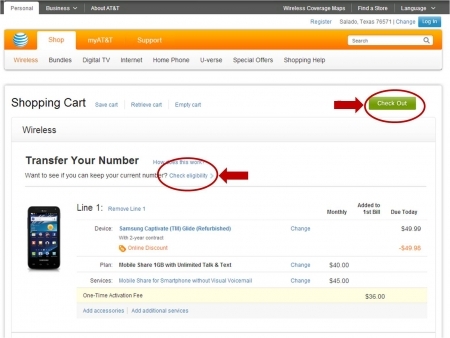 If you are an existing AT&T Wireless customer select "Add a Line" or "Upgrade." Select your AT&T wireless plan. 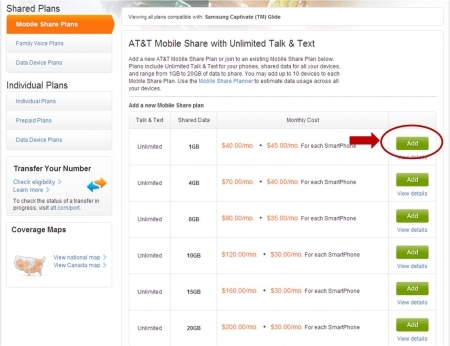 Choose from AT&T Shared Plans or AT&T Individual Plans. Shared plans offer Mobile Share Plans, Family Voice Plans, and Data Service Plans. Individual Plans offer Individual Plans, Prepaid Plans, and Data Device Plans. When you have located the AT&T Wireless plan that best reflects your estimated Talk & Text and Shared Data needs, click "Add" or "View Details." Select any AT&T Services you want to add to your service plan such as AT&T Mobile Protection Pack, Smart Limits for Wireless Parental Controls, Roadside Assistance, AT&T FamilyMap, Detailed Billing, International Long Distance Messaging, Global Messaging, Voicemail to Text, and Enhanced Voicemail. If you do not want any AT&T services, click "No Thanks/Next." Add accessories such as Appcessories, Audio, Batteries, BLUETOOTH, Cases, Chargers, Data/Memory, Docks, Health and Fitness, Hot Deals!, iPad, iPhone, Prepaid GoPhone, Screen Protectors, Specialty Items, and Stylus. If you do not want to add any AT&T Accessories, click "Continue to Next Step." Next you will be asked if you want to add another AT&T device to your Mobile Share Plan. If yes, click "Yes, Add Another Device." If not, click "No, Continue to Checkout." Check to see if your current landline or wireless telephone number is eligible to be transferred to your new AT&T Mobile or Wireless Device. Click "Check eligibility." If you are not transferring a number, click "Check Out." Fill out Contact Information, Bill To Address, Ship To Address, Wireless Place of Primary Use Address, Credit Information, and Payment Information. Click "Continue" to continue with purchase. No one provides more options, wider coverage, or better wireless support than AT&T, period. Make sure to check out their website because for special online deals that you won’t find anywhere else. Whatever type of cell phone or mobile device you’re in the market for, AT&T has got it. They carry all the top brands including Samsung, HTC, Apple, Nokia, Motorola, Sharp, and more. You can browse by operating system, style, features, manufacturer, price, contract length, and new or refurbished. When it comes to connecting, besides their already fast mobile broadband network, they also boast the largest 4G network in the country. You want and demand speed, they deliver it. AT&T also has the nation’s largest Wi-Fi network to keep you connected and helping you save on your mobile data usage. This is indispensable as we all come to depend more and more on tablets, laptops and other mobile devices to get work done, manage our lives, and entertain ourselves on the go. They offer a wide variety of flexible wireless plans to choose from. These include Smartphone Plans, Tablet Plans Quick Messaging & Basic Phone Plans, and Prepaid Phone Plans. Just enter your zip code to find out what’s available and pick an individual, family, or mobile share plan that works best for you. If you’re looking for a pay-as-you-go or prepaid cell phone, AT&T’s GoPhone is a perfect option. No contract, no credit check, no deposit and no surprises. You can choose pay by the month, day or minute. Once you have a phone or tablet, you’re going to need all the accessories to get the most out if them. AT&T has you covered there, as well. Headsets, BLUETOOTH®, memory, batteries, chargers, adapters, cases, and docks – if a mobile device can use it, they have it. So make the switch to AT&T wireless and see what you’ve been missing. Check their site to see if you qualify for special discounts on your service through your employer, school, or military branch. Pick a phone, pick a plan, and don’t forget to use an AT&T wireless coupon code to save on becoming part of the biggest and best wireless family on Earth. In today’s fast moving world where much of real life is also lived online, you have to stay connected or get left behind. AT&T Wireless offers internet and data plans that transform your smartphone, tablet, or wireless device into your very own portable personal assistant. Instant access to directions, email and social media, local weather, movie show times, price comparisons, research, restaurant reviews, shopping, tech tips, tickets, travel info, videos, and more are delivered directly to your fingertips when you choose from the world wide range of AT&T data services. Everyday a new “must-have” gadget hits the market and with an endless stream of ads, commercials, celebrity endorsements, popups, and reviews – it can be difficult to find cellular that’s right for you. We at CouponPal want to help you put your best phone forward, so we’re putting you in the digital loop with our list of top AT&T Wireless web enabled phone picks. Get your tech in check for a fraction of the price by using an AT&T Wireless promo code when you upgrade to one of these super phones or signup for wireless internet today. Faster, lighter, smaller – and smarter than all of its predecessors passed, the iPhone 5 is the latest great thing to happen to Apple and is definitely Mac’s mobile better half. With cutting edge upgrades like the 4” Retina display, 326 pixels per inch, LTE technology, A6 chip, advance globally supported networks, 1080p HD video, Multi Touch, iCloud, and Siri – the iPhone 5 packs a powerful punch that sets it apart and outshines the android armed masses, all brushed aluminum aside. Nature inspired but designed with humans in mind – the Galaxy S III listens, responds, sees, and allows you to share your life with your nearest and dears. This intuitive phone senses when you want to talk, type, or take a photo with innovative features like Direct Call, S Voice, Smart Alert & Stay, and Social Tag. The eye catching 4.8 inches of high definition display, ability to remotely access your files, photos, and multimedia along with the smart keyboard and leading mobile security solutions – all make the Galaxy S III an easy second in the oversaturated e-sea of smartphones. Go wireless like never before with the Nokia Lumia 920. This feature-rich phenomenon stands out from its muted metallic counterparts in bright colors like red, yellow, and white, which match your mood and set the tone for greatness. Featuring an advanced range of multimedia, talk, text, photo, and phone capabilities like City Lens, Microsoft Office, Plugless Charger, Nokia Music, PureMotion, and PureView – the Nokia Lumia 920 is the mobile that does all the work for you and our obvious frontrunner in the amazing race of smartphones. Choose the Nokia 920 to experience the limitless world of Windows with just a few quick clicks on your touch screen. Now that you’ve seen our top phone choices from AT&T Wireless, it’s time to step up your tech game and get modern with one of their state-of-the-art, powered by data devices. While AT&T Wireless gives great service (internet, messaging, and more), we here at CouponPal are helping you shop smartphones the smart way with our 411 on all the deals. Plug in an AT&T Wireless promo code on your next upgrade or new line and say hello to big savings. Ready to get connected? AT&T Wireless has got you covered with everything you could ask for in a cell phone company. Fast connection speeds, great customer service, hottest smartphones? Find all that and more. Here are some questions you might come across while using the site. Why isn’t my AT&T Wireless coupon code working? If your AT&T Wireless coupon code doesn’t seem to be working, check to make sure there aren’t any special restrictions that apply. These restrictions could be things like an expiration date or an offer for a specific phone. To contact AT&T Wireless’ customer service, call 1-800-331-0500 for information on service, billing, and technical support. This service is available everyday from 7 a.m. to 10 p.m. If you want to order new service or track your order, call 1-888-333-6651, Monday through Friday from 7 a.m. to 10 p.m. or Saturday and Sunday from 9 a.m. to 7 p.m. You can also go to the Support page to find Live Chat or email options. What kinds of cell phones does AT&T Wireless carry? They offer cell phones with operating systems from iOS (Apple), Windows, Android, and Blackberry. These systems include the most popular phones like the iPhone, the Samsung Galaxy, and the LG Optimus G.
Does AT&T Wireless carry other products besides phones? They also stock tablets and internet devices. Their tablets include hot items like Apple iPads, Samsung Galaxy Tabs, and Lenovo Idea Tabs. AT&T Wireless also offers the PlayStation Vita, the Samsung Galaxy Camera, and AT&T Mobile Hotspots. How can I determine which phone is right for me? You can easily figure out the perfect cell phone for you by narrowing down your search with the various filters the site offers. You can select contract length, how much you’re willing to pay, the operating system, style, and whether the phone is currently available. With these options you can better determine the ideal phone for your preferences. 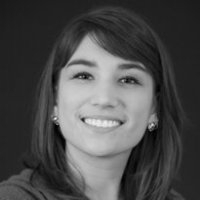 How can I manage my account at AT&T Wireless? You can easily keep track of all the information pertaining to your cell phone plan by clicking on the My AT&T tab at the top of the homepage. This will take you to an overview of your account, where you can see how many minutes or data you’ve used. You can also view your billing information here.